David describes in this chapter a king who was granted all "his heart's desires," and whose prayers were all answered by God. This king has been blessed with everything a king could hope for – longevity, royal authority, honor, wealth, and joy – and David attributes the king's success to his faith and trust in God and His kindness (verse 8). Whereas kings generally credit themselves for their success and refuse to acknowledge any power or authority higher than themselves, David proclaims that this king's success is owed exclusively to the blessings of God. In the second half of this Psalm (9-14), David offers a prayer on the king's behalf, asking God to destroy the king's enemies and foil their sinister plans to wage battle against and overthrow the king. The commentaries disagree in identifying the king of whom David here speaks. Many, including the Targum and Metzudat David, understand this Psalm as a reference to the Mashiach, upon whom God will bestow blessing and success, as described in this chapter. 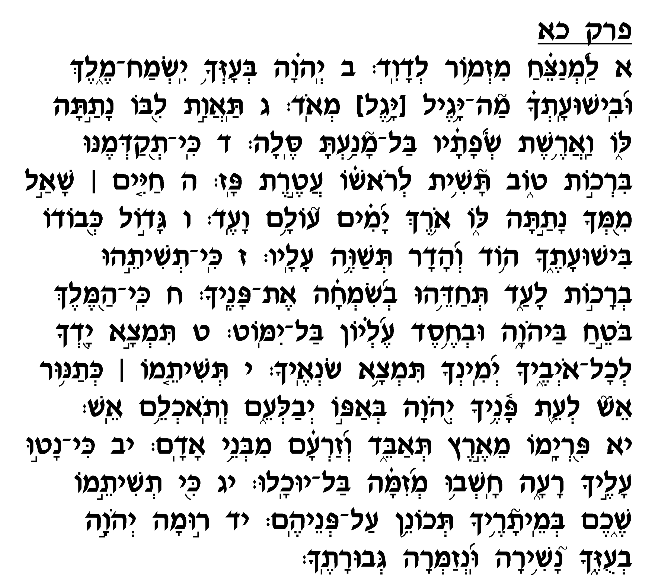 Others, however, including Rashi and Ibn Ezra, claim that David here speaks of himself in third person. David thus expresses his gratitude for the success he experienced during his reign, for the prayers that have been answered, and the great wealth, honor and prestige that he and his kingdom enjoyed.